Objective Journalism? It’s As Easy As ABC – Just Another Social Profile Really. Last week New Zealand got a new Prime Minister. Jacinda Ardern’s victory is incredible for many reasons: she had only been leader of the Labour Party for a matter of months; during that time she shifted the polls from 23% to as high as 43%; she’s New Zealand’s secoond youngest ever Prime Minister, and the youngest since Edward Stafford in 1856 (he was 45 days younger at the start of his tenure). But none of these are the things that The Australian chose to highlight in its front page coverage, instead it seemed struck by the fact that she had polled less votes than Bill English’s National Party. By this logic the headline the day after Tony Abbott took power in 2013 should have read much the same: ditto for Malcolm Turnbull in 2015 as, in both cases, the Liberal Party polled less votes than the Australian Labor Party. 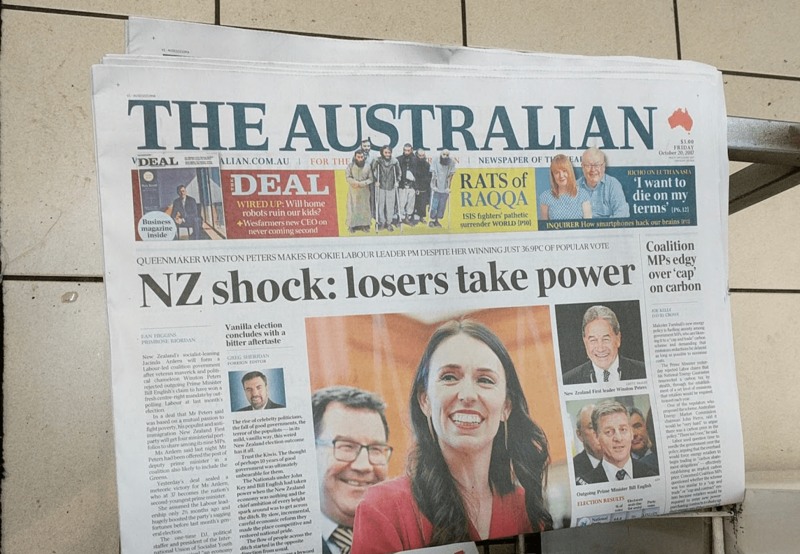 The fact that they weren’t considered losers is down to the fact that in both cases they were part of a coalition which is, of course, what Ardern’s Labour has formed in order to rule in New Zealand. Obviously The Australian is free to spin the result however it chooses: it has no legal requirement to be, shall we say, fair & balanced. And, indeed, how many politicians, organisations or companies ever truly have a majority of the population view them favourably? Well in Australia there is at least one organisation that does. Its name is the ABC. According to the 2016 ABC Appreciation Survey 86% of Australians think that the ABC performs a valuable role, up from 84% in 2015, 69% believe it is efficient and well managed and 77% believe it is balanced and even handed when reporting news and current affairs. This last one is down slightly since 2012 (80%) but still a pretty impressive vote of confidence. It might seem strange therefore that the government is currently asking the ABC to voluntarily release the details of any employee paid more than $200,000 a year and is looking to add a requirement for the ABC to be ‘fair and balanced’ into its charter. Except of course that both are initiatives that were agreed to by the coalition government with One Nation (currently tracking at 9% in national opinion polls). There are obvious reasons that anyone truly interested in a healthy media sector should be worried about these moves, and a solution to put off such meddling that is perhaps less obvious. Firstly, the move to pressure the ABC to disclose confidential salary information is nothing short of government bullying. If the Coalition wants the details disclosed then it should legislate to force such a move. Of course it most likely wouldn’t get the votes so instead is aiming to pressure them to do something that would probably break the Privacy Act. There’s a fair chance it would also help commercial media companies realise how cheaply they could poach ABC staff (particularly if this week’s other news is anything to go by). As for the move to include the words ‘fair and balanced’ in the charter, ignoring the irony that these words were previously used as a strap-line by Fox News, possibly the least fair or balanced media organisation in the English speaking world, there is simply no need to do so: the ABC Act already includes a requirement for ““accurate and impartial (news)…according to the recognised standards of objective journalism”. Wasting parliamentary time on an effort to do so is much more inefficient than anything the ABC is doing, particularly because, as we’ve seen, the majority of the people paying for the ABC (Australian tax-payers) think it’s doing a bang-up job at being impartial already. Secondly, what One Nation, the government and their allies really want isn’t for the ABC to be fair or balanced, it’s for them to stop giving them a hard time. What Pauline Hanson means by fair and balanced is not highlighting how ridiculous her policies are, nor how her organisation is barely straddling the line between incompetence and corruption. She and her party want equal air time to be given to their denials of climate change and support for their unproven and dangerous views on vaccinations. What’s particularly depressing about these attacks is that they are being cheered on by others who claim to be concerned about the overall health of the media. However, for anyone with a truly impartial desire for Australian media & journalism to flourish, it is hard to argue with the speech given by Michelle Guthrie, the ABC’s CEO and former employee of Google & News Corp, in which she made the case that a non-commercial organisation can be no threat to advertising revenues (the case is less clear cut for subscriptions and on the impact of SBS). Legislation designed to further a political vendetta by one party uncomfortable with being scrutinised by our investigative programs is not good policy-making…There is no evidence that the Charter is impacting on the commercial models of existing local companies. Assertions that the ABC is abusing the Charter or exploiting its confines are just plain wrong. They are hurled at the ABC by executives and media commentators who are simply looking for scapegoats for their own woes in a disrupted landscape. Public broadcasters such as the ABC can, if allowed to, support a large network of local production companies, talent, supporting services and the wider media industry – all whilst providing fair, balanced and objective content. So what could the ABC do to protect its position and stave off this sort of short-term political interference? Well, the answer might lie with another public broadcaster in the English speaking world. The BBC faces many of the same challenges in terms of governments that feel unfairly done by and commercial entities claiming victimhood, but has been able to protect itself somewhat (though far from entirely) due to the nature of its funding. Rather than being funded, as the ABC is, directly from tax receipts which means that funds are at threat on a year to year basis, the BBC derives its funds from the licence fee. This is paid directly by consumers (not always willingly it has to be said) and is agreed with the government on a long-term basis (five to ten years at a time). As Jamie Angus, Editorial Director of BBC Global News highlighted at Mumbrella360 earlier this year this long-term view cushions the BBC from some of this sort of news-cycle driven politicking. A license fee also enables the public to understand exactly what they are getting for their money – £147 a year seems like pretty good value to me when you consider the combined output of the BBC across TV, radio & online. Ironically the ABC had a licence fee until Whitlam got rid of it in the 1970s: Pauline Hanson and One Nation often claim they want Australia to go back to how it used to be, so perhaps this is one policy they might get behind.